This is the 7th ODE (Open Dynamics Engine) tutorial. This tutorial explains a joint. There are a lot of joints around us. For example, a hinge of a cellular phone, a hinge of a door, and so on. A joint connect two bodies. In other words, a joint is a constraint which restricts a movement of two bodies. ODE uses a joint in the same meaning of a constraint. *** means a type of joint, such as a Hinge, Ball, Slider, Universal, and so non. Please read theUser Manual of ODE. You can set parameters of a joint. dParamLoStop is the minimum and dParamHiStop is the maximum range of motion. dParamVel is target speed and dParamFMax is maximum torque to apply the joint. Now, a sample program of a hopping robot (above the figure) is shown as follows. In this example, a robot is composed of a hinge joint which connects a torso and a leg. Let’s read the source code. 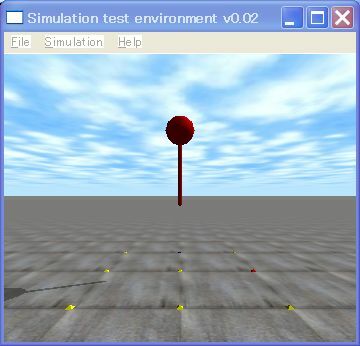 createBallandPole function is to create a ball for a torso , and a cylinder for a leg, and create a joint by dJointCreateHinge(). Bodies were connected with the joint by dJointAttach(). Then, dSetHingeAnchor() sets an anchor of the joint and dJointSetHingeAxis() sets an axis of the hinge joint. This example, the rotation axis vector is set to (1,0,0), i.e., the axis vector is the x-axis. I did not set parameters of the joints to simplify the source code. Usually, you can set many parameters about joints. Please see the ODE user manual in detail. You can download the sample program, sample7-090309.zip, from here. Please download and enjoy it. Create a hinge Joint. dJointGroupID is set to zero. Set an anchor point (x, y, z) of the hinge joint. Set an axis vector (x, y, z) of the hinge joint.